Most so called “Social Media” platforms are advertising platform masquerading as social media. Especially the ones that have gone public and have to publish quarterly financial reports proving their profitability in an effort to keep their stock price elevated. As some of the highest valued stocks on the market, their investors will make sure they charge you for using at least some of their services in any way they can. Their value is mostly based on the amount or traffic and subscribers you and other advertisers give them. They will probably make more money off of your business’s followers than you will. 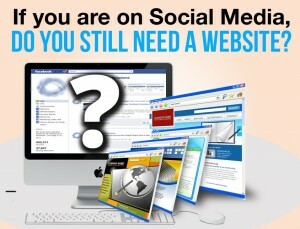 If you are on Social Media, do you still need a website?. Of course, the answer is DEFINITELY! YES! Especially if you are using social media to build an online presence for your business. Don’t get me wrong, this doesn’t mean you shouldn’t be there. After all Facebook is arguably the most targeted advertising medium available to you, and although costs are increasing, they are still relatively low, if implemented effectively. But again, it is just that! An advertising medium with the power to drive targeted users to your message and ultimately your website. Your website should become one of the assets of your business and can even be a significant part of the valuation of your business, depending on the nature of your business and the business that is generated from your website. You can think of your website as the hub of your online activity and ultimately where you drive visitors from your social media and other online and offline advertising activity to convert them into business leads and ultimately convert them into paying clients. Facebook and other social media are looking for ways to increase revenue and over time you can expect more and more, if not all, of their services will cost. We have already seen indications of this with reductions in the exposure your social media posts get and implementation of the ability to pay for greater exposure to followers. Used to be that the majority of your Facebook followers would see your posts. Now I understand up to 12% of your audience will see most of your posts depending on the engagement level, and you can pay Facebook to reach more. You should own your website and be the registered owner of your domain name. You have absolutely no control over Facebook or any other social media entity, unless you have built your own. Although you have some control over the content you post, ultimately, Facebook and other social media have total control over your pages and profiles on their services as well as the price you may pay to use it. It is also good to be aware that social media platforms have discontinued the profiles of some businesses in the past, either accidentally or intentionally “with cause” and there is the possibility that they could discontinue your profile leaving you with little or at least limited recourse. Losing all of your followers is also not out of the realm of possibility. To some degree the same goes for some hosted, build-your-own website solutions, but I’m not going to cover that here because we are talking about “social media” versus owning your own website and domain name and then hosting it with a hosting service which you can change if you desire. I’ll just say if you use a hosted, build-your-own website solutions you don’t really own your website. Social media is an excellent way to reach out to your target market and draw them into your marketing funnel. That said, directing people to your social media profiles develops the social media’s asset not necessary your website value. Brenda Cadman’s post (credit below) on this topic gives 6 reasons why you need a website even if you are on Facebook. Her post 6 Reasons why you still need a website even if you already have a Facebook page inspired me to write this complementary post. ← What type of website do I need?